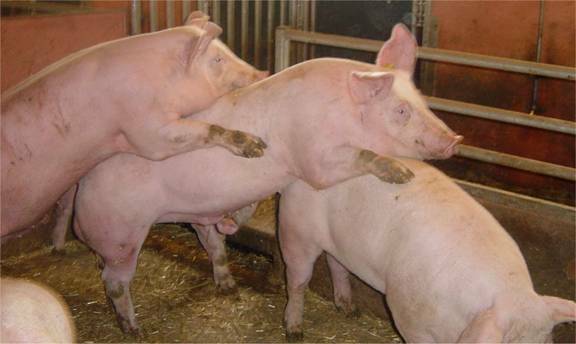 In commercial pig production, where females are reared for meat production and often slaughtered at around 110 kg live weight, a significant percentage of them may reach puberty. At high slaughter weights (over 100 kg) there is a risk that female pigs may become pregnant before slaughter (Andersson et al., 1999; Rydhmer et al., 2006), especially if they are slow-growing, for example from outdoor systems. Entire males are more likely than castrates to display sexual behaviour, such as mounting (Cronin et al., 2003; Rydhmer et al., 2006). Mounting behaviour. Source: Kerstin Lundström. Castration at birth reduces mounting behaviour to the level seen in females. After castration at the age of 30 days, mounting behaviour, as in intact males, persists for another month despite the lack of testes - but then declines (EFSA, 2004).